"Sure you brought us to the right plateau, Professor? Not a dinosaur in sight." The name of Irwin Allen is synonymous with bloated all-star productions with massive disasters and extensive special effects, such as The Towering Inferno. That reputation was first earned in this big-budget all-star remake of Sir Arthur Conan Doyle's classic story, which makes the unfortunate error of dispensing with proper stop-motion animation in order to achieve its effects, opting instead for the cheap, ugly and ridiculous. Doyle's tale is modernized in trappings at least, with airplanes and helicopters serving to ferry its characters around, but the essentials remain the same. Mad Professor Challenger (Claude Rains in a beard and fright wig) announces that he has discovered an Amazonian plateau where dinosaurs survive, and he seeks funding for an expedition to return and obtain proof of his claims. The party for this trip includes adventurer Lord John Roxton (Michael Rennie), his girlfriend heiress Jennifer Holmes (Jill St. John), her brother David Holmes (Ray Stricklyn), photographer Ed Malone (David Hedison), guide Gomez (Fernando Lamas) and skeptical Professor Walter Summerlee. Together they face dangers as they are stranded on the plateau and must survive not only the dinosaurs but a tribe of cannibalistic cavemen and natural disasters. There is actually a fair amount to like in this adaptation, starting with the enjoyably hammy cast. Rains offers a more intellectual interpretation of Challenger, but it's none the less determined or fixated. Rennie is reliable as always, and he gets a good scene in the middle where he discloses his deadly secret in tormented fashion. The rest of the cast is emoting all the way to the cheap seats, except for Jill St. John, who seems content to look cute for the cameras. Not that that's a bad thing. Allen keeps the picture rattling along at a decent clip, not dwelling on any scene very long, and he at least is prompt in getting the cast to the plateau and not spending time unduly fooling around in civilization. But then there are the dinosaurs. Regrettable at best, animal cruelty at worst, they are impersonated by real lizards, mostly iguanas and alligators, with horns and fins attached to them in anatomically improbable manner. The cheap rear projection used means that the color temperature of the dinosaur effects never quite matches up with the rest of the plate, quite destroying what little effect that is being produced. The big dinosaur battle feels uncomfortably close to cockfighting, and it's not nearly as thrilling as the stop-motion equivalent from the 1925 version. Given that Allen had used stop-motion animation by Ray Harryhausen for the dinosaur sequences in The Animal World, it's clear that Allen knew exactly what could be accomplished with this time-honored, but expensive, method. There's no other plausible explanation then, besides an unforgivable penny-pinching, that deprived us of a Harryhausen Lost World. The picture has as a result been disappointing to generations of viewers, and while it's nice to have it on DVD it's still a misfire. Image Transfer Review: The original Cinemascope image is presented in its full anamorphic widescreen glory, with the source print being quite clean and free from defects. Color is vivid throughout, and black levels are at minimum acceptable and often very good. There is some edge enhancement visible in early sequences. Audio Transfer Review: The English track is presented in both stereo and 4.0 Dolby Surround, although directionality is rather limited. It does produce a decent soundstage though ambient presence is lacking. The audio is quite clean and free of significant noise and hiss. Extras Review: Disc 1 of the set includes a promotional featurette The Lost World: Footprints on the Sands of Time (3m:15s), which tries to tie a real archaeological dig and a museum display to the dinos on screen in the movie. A brief excerpt from a Movietone newsreel (59s) features kids attending the opening of the picture, with David Hedison in attendance. An anamorphic widescreen trailer (only 1.78:1, however) uses old-fashioned ballyhoo to drum up business. A set of thorough galleries cover the pressbook (with some articles individually selectable), an onscreen reproduction of the tie-in comic book from Dell, over 200 stills, two dozen posters, lobby cards and ad art, and about three dozen pieces of concept art, costume designs, storyboards and related illustrations round out disc 1. 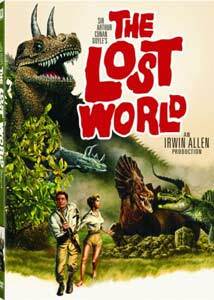 But the real prize is on disc 2: the original 1925 version of The Lost World (a more complete review of which can be found here). This rendition is from the George Eastman House restoration, which includes much of the restored footage from the Image Entertainment version while keeping intact the somewhat racially offensive material relating to the character of Zambo. Philip Carli performs his organ score to the film with a nicely reverberating recording. Also included with the silent are a somewhat truncated trailer (completely lacking any audio) and a 7m:11s set of animation outtakes (previously seen on the Image disc). Should you need your stop-motion fix, the producers of the disc have thoughtfully included it here. The GEH print is in beautiful condition, though at times it seems a little dark. The decision to use real lizards spoils the day, but if you can get beyond it the movie is enjoyably 95 percent solid cheese. The transfer is first-rate, and the inclusion of the silent version is a definite plus.